Wait, Are Oreos Brown or Black? Chocolate comes from cacao beans, and If you’ve ever bought raw cacao powder in the grocery store (aka cold-pressed, unroasted cacao beans), it certainly looks brown. But Oreo doesn’t have any of that fancy cacao! It has cocoa, which is raw cacao that’s been roasted at high temperatures. It’s also been processed with alkali like the label says, which as Food Crumbles explains, results in a reduction of the cocoa’s bitterness and it changes its color. “Alkalization darkens the colour of cocoa powder,” the site says. A ha! That means the cocoa has a browner shade in an unprocessed form and gets closer to black after it goes through alkalization. One more thing. Take a look at this Baking Cocoa Powder from Amazon that’s been processed with alkali: on the label it says Black Cocoa Powder. The description reads: “Black Cocoa Powder has a 10-12% fat content and is often used in wafer-type cookies like those for ice cream sandwiches or in Oreo-type sandwich cookies.” Not just Oreo-type. Like Oreo itself! 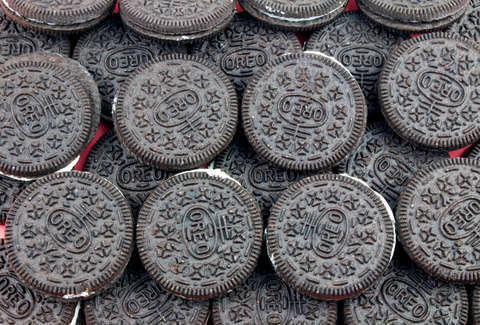 While Mondelez doesn’t want to say that Oreo cookies are black or brown, science seems to lean towards the “cookie is black” side. But we can’t tell you what you see… though if you think it’s brown, you’re wrong, Yanny. You too, Laurel.